The Uplands Cheese facility makes Pleasant Ridge Reserve, and was built 8 years ago in the model of Alpine cheese making. The farmstead cheese makers raise their own herd of cows that are grass fed via rotational grazing. On our WI Milk Marketing Board Wisconsin Cheese Tour, Andy Hatch, Cheese Maker and GM, was a font of information on modern and traditional farming methods, cheese making, flavor profiles, bovine breeds, and more. Don’t think I know what I’m talking about; all the knowledge I’m dropping in this post comes directly from him. Uplands Cheese is a farmstead cheese maker, which means they raise and graze the cows that produce the milk for their cheese – all in one convenient pastoral location. This also means that they have intimate knowledge of their cows – what they eat, how they’re bred (closed herd), if any are injured, etc – and, thereby, have intimate knowledge of their milk. 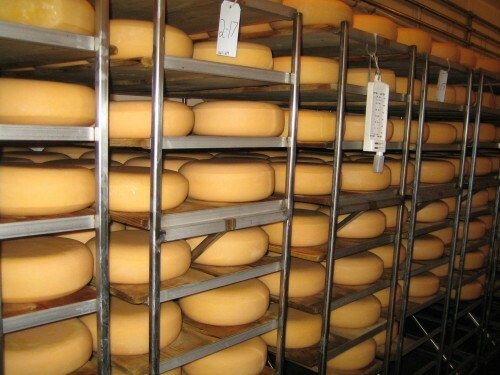 Cheese is made from milk that is transferred directly from the milking barn via lines they maintain, and, therefore, does not need to be pasteurized. Rotational grazing is when the herd feeds on the grass of a different pasture every day, after which the grass in that pasture gets a few days rest. This keeps it in a constant state of growth, ensuring the roughage stays at its peak in sugar content. The milk a cow produces is a result of what it eats. When a cow is fed a diet of hay, the milk tends to be rich and fatty but is less flavorful. The summer-grazing cows at Uplands, however, produce sweeter milk with a fuller flavor complexity, which means the cheese that is made from that milk will contain those attributes as well. From approximately April to October, Uplands grazes their cows and makes cheese, roughly 180 days give or take 30 for heavy or scarce rains. When the grass stops growing the cows are fed hay and Uplands stops making cheese. Milk – which we just covered, but one other thing to note is that Uplands raises a closed herd, meaning they don’t buy cattle but instead breed within the herd they have that is made up of 9 different breed families. Each breed of cow produces different proteins in the milk, which then creates a different breakdown of amino acids in the aging process of the cheese (we’ll get to this in a minute). Make – Uplands makes one style of cheese, a Swiss style, similar to gruyere or beaufort, but a recipe they’ve developed over the years from those styles to create their own. 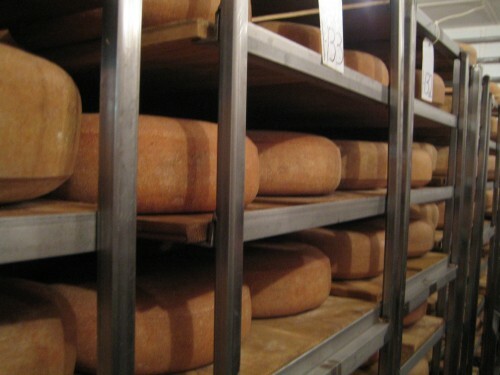 Ripen – Maria, who practically runs the place, washes the cheese wheels with salt twice a week. This creates the natural rind on the cheese and the microbial activity adds to the flavor profile of the cheese. Because each batch is a bit different in the milk stage, each batch will ripen differently. Uplands sacrifices one wheel of each batch for sampling, and every 2-3 months they test the flavor. Most of their cheese is, on average, at peak at the 8-10 month mark. 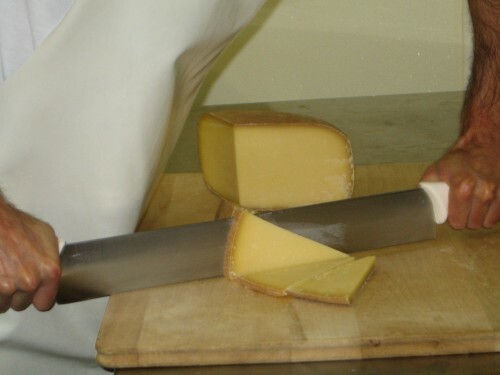 If you remember, at Hook’s we learned that as cheese ripens, it becomes smoother and pinprick crystals form. To many of us consumers, this is what takes aged cheddar, BellaVitano, and Pleasant Ridge from addictively delicious to deliciously addictive. Andy Hatch, however, told us that this crystallization of the amino acids during the ripening process has cost him precious points during awards season. I guess we’ll all just have to agree to disagree with cheese judges. I will eat as much as you slice for me. This entry was posted in WI Cheese Tour and tagged Andy Hatch, farmstead cheese, Pleasant Ridge Reserve, rotational grazing, Uplands Cheese, WI Milk Marketing Board, Wisconsin Cheese Tour. Bookmark the permalink. Ahhh, this is making me want more cheese all over again.